Performers include: Anthony LaPaglia, Poppy Montgomery, Enrique Murciano, Eric Close, Marianne Jean-Baptiste, Roselyn Sanchez, Adriana DeMeo, Ty Miller, Joshua Gomez, Eric Scott Gould. A drama that follows an FBI missing persons team and their cases. Each episode shows the events leading up to a person’s disappearance and the timeline of the efforts to find them. At the end of each episode, information on a real-life missing person is is shown. 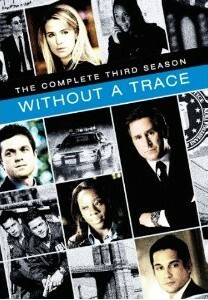 The team includes FBI head of the Missing Persons Unit Special Agent John Michael Malone (Anthony LaPaglia) and special agents Samantha Spade (Poppy Montgomery), Martin Fitzgerald (Eric Close), Vivian Johnson (Marianne Jean-Baptiste), Danny Taylor (Enrique Murciano), and Elena Delgado (Roselyn Sanchez). No plans have been announced to revive the series. • The series ranked in the top twenty for each of five seasons. • The real-life missing persons information is generally not shown in other countries. A few countries replace the US information with details from a case in that particular area. • In 2003, TNT acquired the syndication rights to broadcast the series for $1.4 million per episode. PLEASE BRING WITHOUT A TRACE BACK! PLEEEEEEEEEEEEEEEESSSSSEEEE!